Have you always wanted to be a hairdresser ? Yes, I originate from Italy, having moved to the UK at five years old. I consider England my home, though love visiting my family and village in Puligia. Now I live in Eastbourne with my husband/work partner Gary, son Daniel and small dog Daisey. My creative ability lead me to hairdressing. This journey started at Chichester College. On completion of my two years, I was fortunate to join Crowns in Worthing. Crowns gave me the key foundations to deliver the skills l have continued to learn in my thirty years plus in this industry. I’ve worked in two other salons within Sussex. Ian and Martin in East Grinstead and Topknots based in Heathfield. All three salons have changed names since my time with them though are still business. In between my last two employers I took on new challenges. I landed a job to train as a window dresser. I found this great fun though missed being part of a team as well as meeting people. So back into hairdressing. Within this period I was in partnership with a small successful salon in Forest Row. My early thirties lead me to three years in Bahrain due to family commitments. This brief time allowed me a great insight into hairdressing with different cultures due to the expat community. 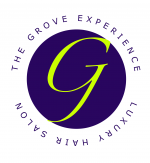 At present I share daily magic with my husband/partner Gary and the incredible team at The Grove Experience. The dream that became a reality in 2009. We opened our doors with a team of four in total, Presently we have 15 in our team with in-house training for our young designers as well as external students. Personally I will do my best to make you feel special and always give you the best advise and direction in creating the style you wish to achieve. I believe in working in harmony with your lifestyle and hair. I have been using this salon for ever and still as happy as the first day I found Gary, Giovanna and their team. I have been long, med short. Browns, blondes and now succumbed with great advice to my natural grey tones. And after my last visit Gio my hair is working very well, with lots of compliments on the style, thank you. One very happy customer.